With NDA’s magic wand ‘Make in India’ initiative gaining credibility, the involvement of private players in the lucrative Indian defense industry has been on the rise. Major private players from India have now teamed with global defense technology providers to equip India with the best military hardware. Responding to the spur from the industry, the government has relaxed the procurement norms and going a notch up the government is all set to bring a reformed and refined ‘Defense Procurement and Procedure (DPP)’ framework for hurdle free procurement process. Tata, Mahindra, Kalyani and Reliance have been actively lobbying in the power corridors to secure strategic projects which promise to keep the factory lines rolling for years. Probably the real giant in the avail is the Reliance Corporation headed by Ambani. Reliance has shown keen interest in involving itself with the Indian defense industry, key executive level meetings have been conveyed and every possible way to secure foreign partnerships is being worked upon. The modernization of ‘armed forces’ has been the key policy for Modi’s government, the modernization of Navy has been receiving due impetus with the naval force floating tenders every passing day. With China’s naval rise and presence of its naval assets in the backyards of India, the Indian Ocean it is no wonder the Indian Navy has long way to go before taking the Chinese head-on. The key factor for this would be induct more naval platforms that can help, India project its power even to the remotest parts of the IOR. Reliance has shown renewed interest in constructing the latest naval platforms for the Indian Navy. Reliance recently has taken a major share in the Gujarat based Pipavav shipyards. Reliance dreams to enter the complex world of shipbuilding by teaming up with the experienced Pipavav marine engineers, who have floated out patrol ships to guard Indian coastal waters. Reliance has shown interest in the P-75 I project and has also ambitions of mastering the complex technology involved in the building of nuclear powered attack submarines with the assistance of Russian shipyards. 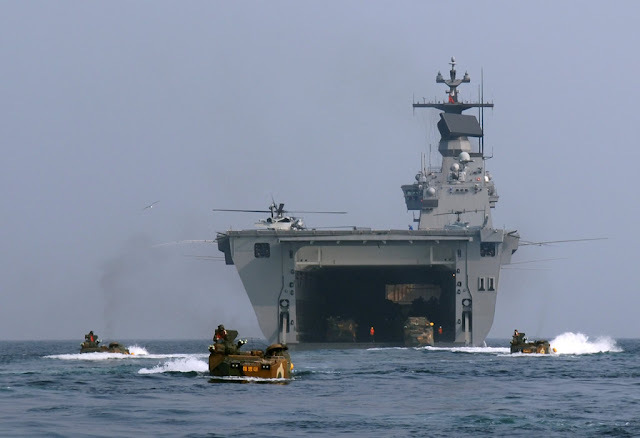 It is now learnt through reliable sources that, Pipavav officials have sought the help of South Korea to participate in the LHD tender floated last year by the Indian Navy. Pipavav officials are believed to have shown keen interest in indigenously building the Dokdo-class helicopter dock ship pitched by Hanjin heavy industries. Indian navy, last year had floated a tender worth nearly US $2.5 billion for procuring four latest LHD vessels. Designated the as the multi-role support vessels these platforms not only serve as helicopter docks/carriers but can also be a boost for the navy since these vessels promise to help achieve navy’s dreams of mounting amphibious assaults. These platforms can also house STOVL/VTOVL aircraft thus proving to be a stand-in aircraft carrier. In accordance to the tender, the navy will acquire four vessels designated as the multi-role support platforms. Of the four vessels two will built in foreign shipyards and the rest two will be built indigenously in an Indian shipyard. But the project is being conceived under the ‘Make in India’ initiative, which would mandate building all the four vessels in an Indian shipyard with full ToT to the Indian company. The tender value is inclusive of the air wing and all defensive & offensive systems which are to be incorporated to the vessel. With Indian navy formally rejecting, France offer of selling the Mistrals which were originally built for the Russians, the procurement has taken wings. The main back draw with the Mistrals was the podded propulsion systems which has been a no-no in Indian navy for quite some time. Reliance is slated to have a tough competition with other shipyards pitching some of the most advanced vessels under the program. Even though the French built Mistrals were denied, the Mistrals cannot be ruled out f the race since France will surely make headway in replacing the podded propulsions to meet India’s demands. 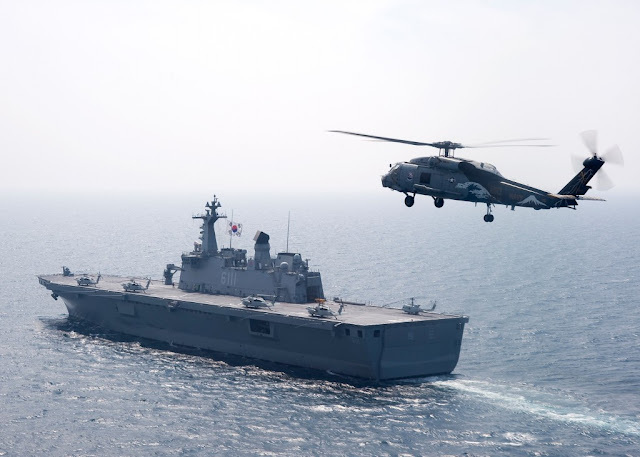 Being operated by the South Korean navy, the Dokdo-class helicopter dock vessel is the flagship of the raising regional Asian power. 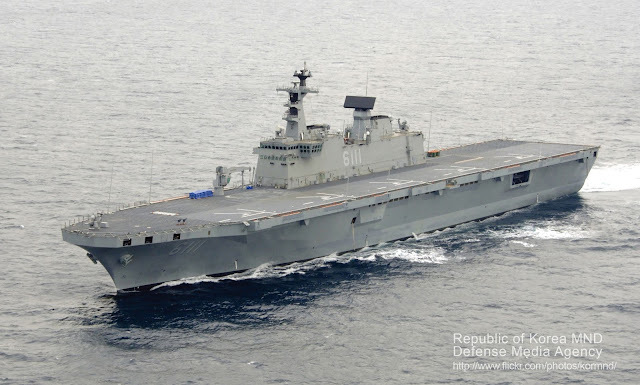 South Korean navy currently operates a single Dokdo LHD and another LHD vessel is under construction which is slated to join the force by the year end. Displacing around 18,000 tonne, the Dokdo’s are undoubtedly one of the most capable support vessels for the Koreans. The vessel’s airwing is centrically formed around the UH 1 huey and Blackhawk helicopters which take care of the troop transportation and also are part of the ASW and SOR missions. South Korea is a working partner for USA’s ambitious F-35 project, and the South Korean navy has plans of operating the F 35 B VTOL jets and from the Dokdo-class vessels. Dokdo-class vessels measure around 200 meters in length and are 31 meters wide. The vessels can accommodate and operate helicopters and VTOL jets from the flat deck. The requirement according to the LHD tender floated by the Indian navy, the vessel has to measure 215 meters in length. The vessel currently accommodates ten UH 60 Sea hawk helicopters, Indian navy has plans of operating the heavier CH 53 Sea Stallion and the CH 47 helicopters from the deck of the vessel and this can be confirmed with the set-bar of 35 tonne for the vessel. These vessels can also carry 720 marines and also house amphibious assault vehicles to mount amphibious ambitious assaults on enemy shores.The vessel is guarded by 300 officers and sailors in charge of operating the platform to the best of its capability. Indian navy has a requirement of hosting 1500 personnel's, which will be a fine mix of 900 marines and 500 sailors. Perhaps this can turn out to be the major drawback of these vessels with the deficient being as high as 500 personnel’s.Squeezing in these personnel would be a demanding task as major redesigning has to be carried out. The vessels are also expected to carry six main battle tanks,20 infantry combat vehicles and 40 heavy trucks. But the Dokdo can carry 10 tanks, 10 trucks, 7 AAVs, three field artillery pieces, and two LCAC hovercraft. Even though this a drawback for the Dokdo-class vessels, the cheer would be for the less competition in this sector as only the American San Antonio Class LHD would be making it through this set-bar. The vessel would also be equipped with point defense missile systems and CIWS systems. The defensive capabilities of the vessel will be formed around the decoy, chaffs machine gun systems. Currently the Dokdo-class vessels are equipped with ‘rolling air-frame missile’ for point. With renewed interest from Reliance and Hanjin, the Dokdo may make the cut with minor redesigning be constituted for matching Indian navy’s need. South Korean ship building capabilities are unmatched and if cleared for the LHD tender, a new dawn will be signalled in the Indian ship building capabilities.